A Disk On Module (DOM) contains all of the system's critical software. If it stops working for any reason, your system firmware could be inaccessible - or worse. With Thecus®' unique Dual DOM (OS Redundancy) design, a secondary DOM automatically reprograms the primary DOM if it fails, meaning your data is always safe and accessible. When it comes to data management, Thecus NAS truly let you have it your way. 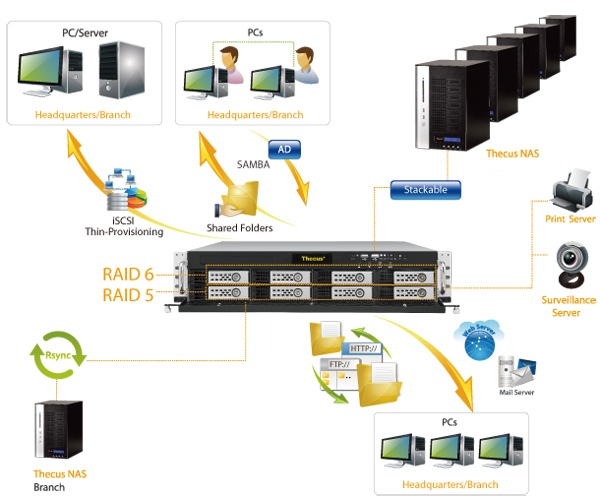 Create multiple RAID volumes each supporting different RAID modes including RAID 0, 1, 5, 6, 10,50, 60 and JBOD for your own balance of performance and data protection. Should a hard drive malfunction occur, changing one is simple thanks to online RAID migration and expansion, hot spare, and auto rebuild. Thecus is releasing a new line of network attached storage that takes on a quickly growing part of the market: high-capacity, high-value storage. 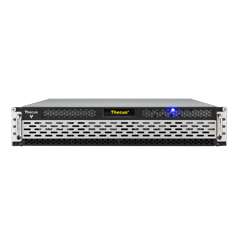 The value, or “V”, line, supplement Thecus's existing full lineup of NAS, by giving users a choice between more value and more power. 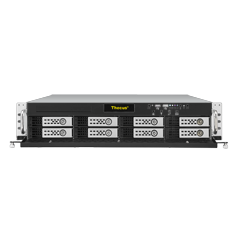 These new NAS combine the newest line of powerful Intel® processors and Thecus's potent software to provide a solution that can accommodate a broad spectrum of business and personal storage and computing needs while staying within your budget. The N8900V is the unification of power and price, functionality and frugality. 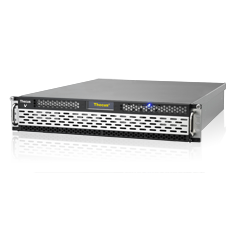 The new Intel® Pentium™ G620 running at 2.6GHz keeps user requests screaming along and allows the N8900V to multitask smoothly, balancing such activities as data transfer, web serving, and RAID building without any delays or slowdowns in service. 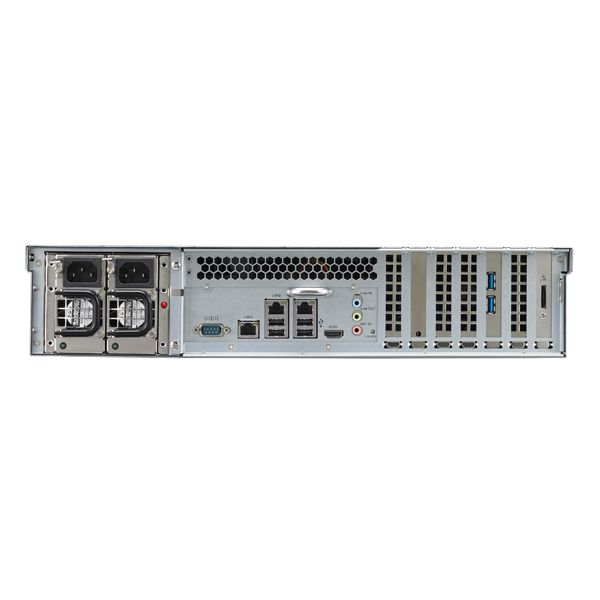 The N8900V adds an important choice for consumers in need of an 8-bay NAS at a great value and is the unchallenged highest performance and function for price option on the market. It promises to set new standards in an environment increasingly leaning towards cost-saving measures that still guarantee data integrity and professional functionality. The N8900V is the best option for a small or medium businesses on the rise. Its 24TB can be used as a shared data hub, iSCSI connectivity offers flexible thin-provisioned storage or simple virtualized environment integration, USB 3.0 allows for high-speed local transfers, and 10 gigabit Ethernet readiness prepares your setup for the new standard in data center connectivity, among a wide range of other functions. It even supports 10GBASE-T, the protocol that allows high-speed 10 gigabit transfers over low-cost Ethernet cables, the standard Ethernet cables that everyone has around the house! The N8900V has every function a professional NAS should offer and even a few more up its sleeve. A large number of Thecus-exclusive functions set the N8900V apart from the crowd. It comes with three PCI-e slots to add expansion cards such as high-speed 10 gigabit Ethernet and more USB 3.0 connections, it has an HDMI output for local display without a computer and unlimited expansion via Thecus and third-party apps, and it joins other Thecus enterprise NAS in making Thecus the only NAS brand that supports high-end SAS drives along with the standard SATA HDD's. Also packed into the box, Acronis True Image gives users a well-designed, professional software backup solution to simplify storage and backup tasks. “While IT budgets are tightening, the need for quality high-capacity NAS has, paradoxically, never been so strong within professional environments. Combining Thecus quality standards, innovations and high-value hardware, the V series is designed to bring customers alternative solutions and help them to manage their critical resources without crippling their budget” says Florence Shih, General Manager of Thecus Technology Corp. Setting and working with IP addresses can be very complicated even for advanced users. Read through some basic guidelines of how IP addresses work and how this can help you navigate your networking and your NAS. 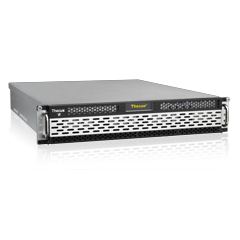 Discover NAS on your local network and perform some basic setup steps including RAID creation and assigning IP addresses. Connect to your NAS from within OS X for straightforward file copying within a familiar environment. AFP allows you to access your NAS as easily as an external hard drive. Connect to your NAS with this Linux protocol from OS X. NFS allows you to access your NAS as easily as an external hard drive. Connect to your NAS with this widely used protocol. SMB allows you to access your NAS as easily as an external hard drive. A few basic steps on how to connect to your NAS through your web browser. The Web Disk application (also known as WebDAV) allows you to manage and manipulate files on your server. Aria2 is a lightweight multi-protocol & multi-source command-line download utility. It supports HTTP/HTTPS, FTP, BitTorrent and Metalink. aria2 can be manipulated via built-in JSON-RPC and XMLRPC interfaces. Transmission is a cross-platform BitTorrent client. Appealing to a broad range of users, XBMC is an open source media center which was originally created for Xbox. Its graphical user interface (GUI) allows the user to easily browse and view videos, photos, podcasts, and music using only a few buttons. Currently, XBMC can be used to play almost all popular audio and video formats around directly from your hard drive. XBMC features playlist and slideshow functions, a weather forecast, and many audio visualizations. Dropbox is a free cloud service that lets you bring all your photos, docs, and videos anywhere. After you install Dropbox on your computer, any file you save to your Dropbox folder will automatically save to all your computers, your mobile device, and even the Dropbox website. The System Failover function requires two sets of Thecus NAS systems (one acts as active and the other one as standby) to have near line system configuration and data backup. When the active system goes down for any reason, the standby will take over, all of system's configurations and data will be kept in last sync state. This tutorial is separated in three parts. The first part will teach you what's iSCSI and how it can be used. The second and third part would be practical demonstration on iSCSI Target/Initiator. Only the second part requires a Thecus NAS!